The pygmy rabbit (Brachylagus idahoensis) is a North American rabbit. It is found in the desert areas of the Great Basin and Montana. The pygmy rabbit is the world's smallest leporid. An average adult weights about 375 to about 500 grams (0.827 to about 1.102 lb). It has a body length of 23.5 to 29.5 centimeters (9.3 to 11.6 in). The female rabbit is slightly larger than the male. The pygmy rabbit is different from other leporids by its small size, short ears, gray color and small hind legs. It also does not have any white fur on its tail. Weasels are the main predators of pygmy rabbits. Coyotes, red foxes, badgers, bobcats, owls and hawks also hunt pygmy rabbits. 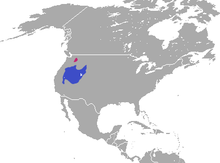 One isolated population, the Columbia Basin pygmy rabbit, is listed as an endangered species by the U.S. Federal government. The International Union for Conservation of Nature lists the species as lower risk. This species only lives naturally in the Columbia Basin of Washington State. The last male purebred Columbia Basin pygmy rabbit died March 30, 2006, at the Oregon Zoo in Portland. The last purebred female died in 2008. A program by the Oregon Zoo, Washington State University and Northwest Trek is trying to preserve the genes by breeding surviving females with the Idaho pygmy rabbit. ↑ Rachlow, J.; Becker, P.A. ; Shipley, L. (2016). "Brachylagus idahoensis". The IUCN Red List of Threatened Species (IUCN) 2016: e.T2963A45176206. doi:10.2305/IUCN.UK.2016-3.RLTS.T2963A45176206.en. http://www.iucnredlist.org/details/2963/0. Retrieved 13 December 2017. ↑ Goodwin, George Gilbert; Drimmer, Frederick (1954). The Animal kingdom: the strange and wonderful ways of mammals, birds, reptiles, fishes, and insects; a new and authentic natural history of the wildlife of the world, Volume 1. Cornell University. p. 246. ↑ Goodwin, George C. (1962). Small mammals. Cornell University. ↑ Sharth, Sharon (1999). Rabbits. p. 12. ISBN 156766587X. ↑ Green, Jeffrey S.; Flinders, Jerran T. (1980). "Brachylagus idahoensis". Mammalian Species 125: 1–4. doi:10.2307/3503856. http://www.science.smith.edu/msi/pdf/i0076-3519-125-01-0001.pdf. This page was last changed on 25 October 2018, at 12:39.